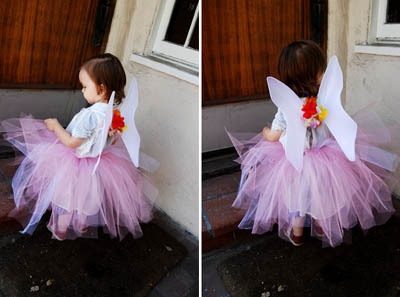 This no sew baby tutu sewing pattern is a quick and cheap costume or dress-up accessory. A must for any budding ballerinas and fairy or princess enthusiasts. 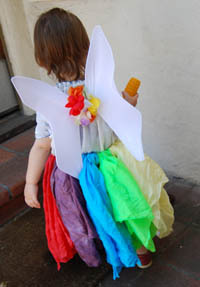 Here is the fairy wings tutorial for the wings in the photo. I admit, this isn't much of a pattern as it is a tutorial, it is just too darn easy to need a pattern. I'll give you the abbreviated version since variations of this tute have circulated the internets for a while. For a more detailed explaination, check out Plumtickled's tutu sewing pattern. Cut lengths of tulle (twice as long as you want your skirt length to be) and then tie them on your elastic loop. Rinse, repeat. Done! You don't have to use tulle for your baby tutu. In fact, it is scratchy and pretty yucky to wear, in my opinion. So unless you happen to have some like I did (leftovers from a baby shower) you might consider picking a different material entirely. Same idea, just tie on your fabric to an elastic loop. In these photos I used 35" square playsilks that I dyed with KoolAid. After wearing the skirt, just untie the knots and your scarves to back to being, well, scarves. Those scarves are perhaps the most versatile "toy" we own! Of course the wooden corn this wee fairy is holding as a "wand" is pretty versatile too. It doubles as a microphone. A singing, corn wielding, rainbow fairy? You bet! Return to the Handmade Baby Costume Section for more project ideas!